I’m just going to come right out and say it: I don’t love to travel. Maybe it’s the introvert in me, maybe I’m just old at heart, but I much prefer to stay close to home, taking only short jaunts out into society to be among the people before retreating back to the place I know and love. Nicholas, however, is all about it. He’s not into material things at all and would happily spend all of his disposable income on long weekends spent visiting friends and family, attending sporting events, etc. I die a little inside at the thought. This girl needs some solitude and quiet time. The only vacations I truly enjoy are to the beach, where it’s perfectly acceptable to sit and be silent and stare off into the horizon. Alas, this week I find myself packing it up and packing it in for the second time in a month for the purposes of Nick’s sports obsession (the beach trip was for a fantasy football draft and this one is so he can attend the UT – Ole Miss game. Why does he care about UT and Ole Miss? I don’t understand). Make a list. I keep a master list on my phone of what to pack when we travel. Each time we’ve got a new trip planned I’ll copy and paste it into a new note and customize it for that particular trip. Instead of deleting items I’ll place an X or some other symbol in front to mark that it’s packed, then I use the same list to ensure we don’t forget anything when heading back home. Contain the miscellany. Anything that doesn’t go in a suitcase–food, diapers, camera, laptop, etc.–must go in some sort of container. My go-to technique is to pack all the small, random stuff into a plastic tub like the one you see above. Stuff we’re most likely to use goes on the top, just-in-case items go on the bottom. 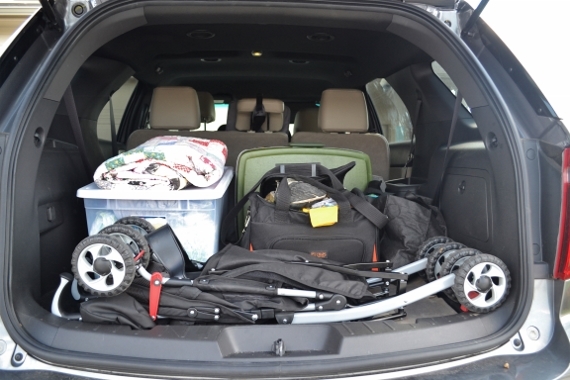 It makes loading and unloading the car a much simpler process. Unpack if it’s at all practical. I mean, if you’re just staying one night then this might be overkill, but even for just two nights I think that the five minutes it takes to put all your clothes in drawers and your sundries near the sink is worth saving the hassle of digging through a suitcase every time you need something. Consider what you’ll need on the way. I usually pack two small bags or totes for the passenger area of the car. One contains items we’ll only need when stopped–diapers and wipes, Jack’s bib and portable placemat, etc.. This one does not need to be within my reach. The other bag I put either at my feet or in the backseat where I can still easily reach it and fill with toys, snacks, sippy cups, etc. Even though Jack’scar seat is rear-facing I can easily reach over it from the passenger seat to hand him toys and snacks when he gets fussy. Bonus tip: bring food. Most hotels have at least a microwave available so we’ll bring oatmeal, squeeze pouches of applesauce (Jack likes it mixed into his oatmeal), raisins, carrots, bananas, peanut butter, bread, fruit cups, granola bars, etc. so that we have the option to eat out or stay in. If there’s a minifridge we’ll even pack an insulated bag with string cheese and whatever else looks good in our fridge at home. Throw in some plastic silverware and microwaveable bowls and you’re all set to serve meals in style. Another item that we always bring is a large blanket, and today we’re taking it and a tote bag full of food out to have a lovely picnic in one of Austin’s picturesque parks. I’m hoping to hit up a thrift store or two along the way, so wish me luck! Have a great weekend, y’all, and thanks for reading! Oh, my, have you had a chance to watch the bat flight from the park under the bridge? So cool. We saw the bats when we were here in April. It is very cool! When we are on a long trip that involves two or more nights in motels along the way, we hang our clothes on a bar in the van. (Advantage to having no small ones.) Each day we carry only the outfit that we are wearing the next day and ourur personal care items, clean undies etc. which are in a small separate bag. That way,we don’t take so much in each time. Everything goes in when we get to our final destination. It works for us. Wow, that’s a great idea! Efficiency is key, I always say.